Bound with a collection of histories and documents relating to the Cistercian Abbey of Hailes, in Gloucestershire, the Chronicle of Hailes covers the period from Brutus--the Brut of medieval literature, a Breton who founded the kingdom of the Britains--to 1314, during the reign of King Edward II. 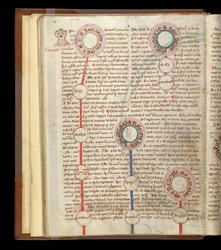 The linear arrangements of the discs giving the names pre-Anglo-Saxon kings which were strung down the centre of previous pages now gives way to an ingenious variation to show the co-existing rulers of the multiple early English kingdoms. Each kingdom has a large disc from which trails a line of small discs bearing the kings' names. On this page, the contemporary acts of rulers of Kent, Wessex, Sussex and Mercia are presented.